Not the best Flash Gordon collection, but worthy of its place on a collector's bookshelf. Dark Horse continues to re-release pretty much every Flash Gordon comic ever published with Flash Gordon Comic Book Archives Volume 5. Released in December of 2011, this hardcover collection includes Whitman Comics’ Flash Gordon #28-#37 (originally published 1980-1982) and features the three-part adaptation of the 1980 cult classic film with stunning artwork by legendary Flash Gordon artist Al Williamson. Beginning with the Filmation animated series and the previously mentioned 1980 film, I’ve been a fan of Flash Gordon for nearly my entire life. I’ve enjoyed the original Alex Raymond strips as well as later works by brilliant artists such as Mac Raboy. I even love those corny serials from the 1930s (however, the less said about the recent SyFy series, the better). So when a package from Dark Horse arrived in the mail and I opened it to discover a review copy of this book, I was elated. When I flipped it over and was smacked in the face by a picture of Sam J. Jones, Melody Anderson, Max Von Sydow, and Ornella Muti in full Mongo regalia, I might have even squealed a little. Like many fans my age, the movie still holds a special place in my heart. And since we’re talking about the movie, I’ll be honest with you from the get-go: As Michael T. Gilbert says in the introduction of this volume, “The high point of the Whitman Flash Gordon comics was Al Williamson and Bruce Jones’ three-issue adaptation of the 1980 Flash Gordon movie.” And if you’ve ever seen Al Williamson’s work, especially his work on Flash Gordon, you know exactly what Mr. Gilbert is talking about. Next to Alex Raymond, Williamson is generally considered the greatest artist to work on the character and in this writer’s opinion, he can’t be topped when it comes to action/adventure and sci-fi sequential art. So getting the film adaptation was a definite plus. Which is not to say that Williamson is the only talented artist to put pen to paper and illustrate the two-fisted science fiction thrills of the man who Freddie Mercury referred to as the “King of the Impossible”; as a matter of fact, this collection includes artwork from Carlos Garzón and Alden McWilliams, both of whom work in a graceful, yet action-packed style reminiscent of the original strips and are worthy successors to Alex Raymond’s crown. And on a personal note, I actually owned the final two issues in this collection as a child, no doubt purchased in a Whitman three-pack at the local grocery store, and seeing these comics again brought back a flood of welcome memories. It makes it a bit challenging to offer a completely unbiased review. However, the book is not without its faults. The first few issues contained within are illustrated in what can only be described as a staid and stale artistic style. While Gene Fawcette and Frank Bolle are no doubt excellent craftsmen and worthy to illustrate these, or any other stories, they simply lack the elegance that the other cartoonists in this volume possess. It takes nothing away from their talent to say “That guy’s no Al Williamson” because as I already stated earlier in this review, few are. Still, when combined with the rather stodgy and simplistic writing in a few of these yarns, the finished product, while entertaining, isn’t exactly going to blow anyone’s doors down. And while I absolutely loved seeing the film adaptation in full color, I have to be completely honest in telling you that the version published in 2009’s Al Williamson’s Flash Gordon: a Lifelong Vision of the Heroic looks much better than the one presented here. This is no doubt due in part to the size of the book (the Williamson book is 11.8” x 8.9” while this Dark Horse collection is 10.5” x 6.9”), but the presentation in this volume is very muddy looking and in general, was a little disappointing to me. All-in-all though, it’s hard to give this book a bad review. 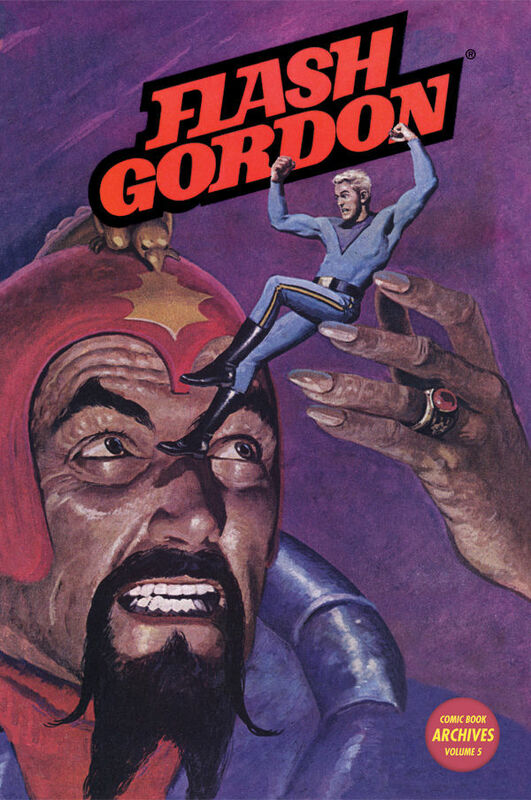 Is it the best Flash Gordon collection out there? Absolutely not. But it is a good one, and while a few of the stories might not set the world on fire for modern audiences, they’re solidly crafted and definitely enjoyable for all ages, which is a big plus. By no means is Flash Gordon Comic Book Archives Volume 5 going to be the first book a Flash Gordon fan twill want in their collection (nor should it be), but as a fan myself, I will happily place it on my bookshelf, resting assured that it is absolutely worthy of being there.